It’s a simple fact: Raising a child with disabilities can be difficult. The real choice in accepting or rejecting a child with special needs is never between some imaginary perfection and imperfection. None of us is perfect. No child is perfect. The real choice in accepting or rejecting a child with special needs is between love and unlove; between courage and cowardice; between trust and fear. That’s the choice in our personal lives. And that’s the choice in our life as society. Most children with disabilities have a lifelong variety of health challenges, some of them serious. Government help is a mixed bag. Services for the disabled — who often lack the resources, voting power and lobbyists to defend their interests — are tenuous. In some places, the law requires good support and care, but legislators ignore their funding obligations, and no one holds them accountable. The ugly economic reality about persons who are disabled is that, in purely utilitarian terms, they’re never worth the investment. That’s the bad news. But there’s also a lot of good news. A baby with Down syndrome birthed in 1944, the year when I was born, could expect to live about 25 years. Many spent their entire lives shut up in public institutions. Today, people with Down syndrome often survive into their 50s and 60s. Most can enjoy happy, productive lives. Most live with their families or share group homes with modified supervision and some measure of personal autonomy. Many hold steady jobs in the workplace. Some marry. A few have even attended college. And just as some prejudiced people resent the imperfection, the inconvenience and the expense of persons with disabilities, many other people of “normal” health and intellect see in such persons an invitation to be healed of their own sins and failures by learning how to love. Many families in this country are now waiting to adopt children with disabilities. Many of these families already have, or know, a child with special needs. They believe in the spirit of these beautiful children, because they’ve seen it firsthand. Many businesses all over the country now welcome workers with special needs. Parents of these special employees say that having a job, however tedious, and earning a pay check, however small, gives their children pride and purpose — and these things are more precious than gold. One of the high points of my year as a bishop, every year, is celebrating Mass for persons with disabilities — this year scheduled for Saturday, March 21, at the cathedral. With the World Meeting of Families looming this September, it’s an ideal time to remember that many of our finest Philadelphia region Catholic families live the everyday experience of loving and protecting a child or adult with disabilities. It’s also a good time to acknowledge and thank God for the ongoing ministries of the Church in Philadelphia that reflect our commitment to persons with special needs: efforts like the Catholic Social Services Developmental Program Division, including Divine Providence Village, Don Guanella Services, St. Edmond’s Home; the Community Outreach Program; Life Sharing through Family Living; as well as the Catholic Special Education Schools; Learning Support Programs; and the ministry of the Deaf Apostolate. Even more important are the efforts of many of our parishes to be welcoming and accessible to the needs of young people and adults with disabilities. Many of our parishes make their religious education programs available to the formation needs of children and adults with a variety of disabilities. The sensitivity of our pastors and clergy in providing the sacraments to persons with disabilities and creating welcoming Sunday Liturgies is also admirable. Additionally, since 2013, Lily’s Gift, a collaboration of the archdiocesan Office for Persons with Disabilities, Catholic Social Services and the Office of Life and Family, has offered ongoing support to couples who receive a poor prenatal diagnosis that could result in death or a disability for their unborn child. And trained archdiocesan peer companions who themselves have had the experience of children with special needs offer emotional, spiritual and practical support so that the parents know they’re not alone and that their baby’s life is profoundly valued. Here’s my point this week: In the eyes of God, nothing is more beautiful or precious than a person with special needs. So I warmly encourage families who have members with disabilities and parishioners who want to come together to show their support for the value and dignity of all life, to join me March 21 for the Mass for persons with special needs. I sincerely hope to see you there. The annual Archdiocesan Mass Honoring the Gifts of Persons with Disabilities, the Deaf Community, Family, Friends and Caregivers is Saturday, March 21 at 10:30 a.m. at the Cathedral Basilica of SS. Peter and Paul at 18th and Benjamin Franklin Parkway, Philadelphia. 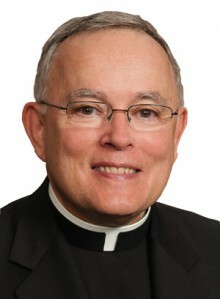 Archbishop Charles J. Chaput will be the principal celebrant and homilist. St. Kevin’s Adult Choir and Catholic Community Choir will be the guest choirs. There will be a light reception immediately following the Mass. All are Welcome. Read about the Mass here or RSVP here. For more information call the Office for Persons with Disabilities at 215-587-3530. Wonderful! And I hope this is indicative of a clear teaching that children with developmental or cognitive disabilities or delays will be able to receive Holy Communion. There have been too many cases, easily found on the internet, where they have been denied because of “lack of understanding”. its agreat message of hope. i will share it with my parishioners in my parish in the sunday news letter. its encouraging.these people should be supported.